A simple definition of cloud computing is it is a technique for providing various services on virtual machines allocated on large physical machine pool which resides in the cloud. Many applications are moving to cloud computing. Cloud is a term used as a metaphor for the wide area networks (WAN) or any such large networked environment. It came from the cloud-like symbol used to represent the complexities of the networks in the schematic diagrams. It denotes all the complexities of the network which may include everything from servers, data centers, cables, routers, and all such other devices. We have lots of computing power and cloud storage capacities residing in the distributed environment of the cloud. What cloud computing does is to harness the capabilities of these resources and make available these resources as a single entity which can be changed to meet the current needs of the user. The basis of cloud computing is to create a set of virtual servers on the available vast resource pool and give it to the clients. Any web-enabled device can be used to access the resources through the virtual servers. Based on the computing needs of the client, the infrastructure allotted to the client can be scaled up or down. Also Read: What Is Thin Client Computing? There are basically four different deployment models of cloud computing. Public Cloud: Also known as an external cloud. It is traditional cloud computing where resources are dynamically provisioned on a fine-grained, self-service basis over the Internet or via and or from an off-site third-party provider who bills on a fine-grained basis. Community Cloud: If several enterprises have same requirements and seek to share infrastructure to realize the benefits of cloud computing, then a community cloud can be established. This is a more expensive option as compared to the public cloud as the costs are spread over fewer users as compared to a public cloud. However, this option may offer a higher level of privacy, security and/or policy compliance. Hybrid Cloud: Hybrid Cloud storage means either two separate clouds joined together (public, private, internal or external) or a combination of virtualized cloud server instances used together with real physical hardware. A correct definition of the term “Hybrid Cloud” is probably the use of physical hardware and virtualized cloud server instances together to provide a single common service. Two clouds that have been joined together are more correctly called a “combined cloud”. Private Clouds: Private clouds describe offerings that deploy cloud computing on private networks. It consists of applications or virtual machines in a company’s own set of hosts. They provide the benefits of utility computing shared hardware costs, the ability to recover from failure, and the ability to scale up or down depending upon demand. With cloud computing, any application supports multi-tenancy – that is multiple tenants at the same instant of time. The system allows several customers to share the infrastructure allotted to them without any of them being aware of the sharing. This is done by virtualizing the servers on the available machine pool and then allotting the servers to multiple users. This is done in such a way that the privacy of the users or the security of their data is not compromised. Cloud computing services are linearly scalable. The system is able to break down the workloads into pieces and service it across the infrastructure. An exact idea of linear scalability can be obtained from the fact that if one server is able to say 1000 transactions per second, then two servers can process 2000 transactions per second. Any application or any service running in a cloud computing environment has the property of self-healing. In case of failure of the application, there is always a hot backup of the application ready to take over without disruption. There are multiple copies of the same application – each copy updating itself regularly so that at times of failure there is at least one copy of the application which can take over without even the slightest change in its running state. Cloud computing systems are all service oriented – i.e. the systems are such that they are created out of other discrete services. Many such discrete services which are independent of each other are combined together to form this service. This allows re-use of the different services that are available and that are being created. Using the services that were just created, other such services can be created. The applications in cloud computing are fully decoupled from the underlying hardware. The cloud computing environment is a fully virtualized environment. 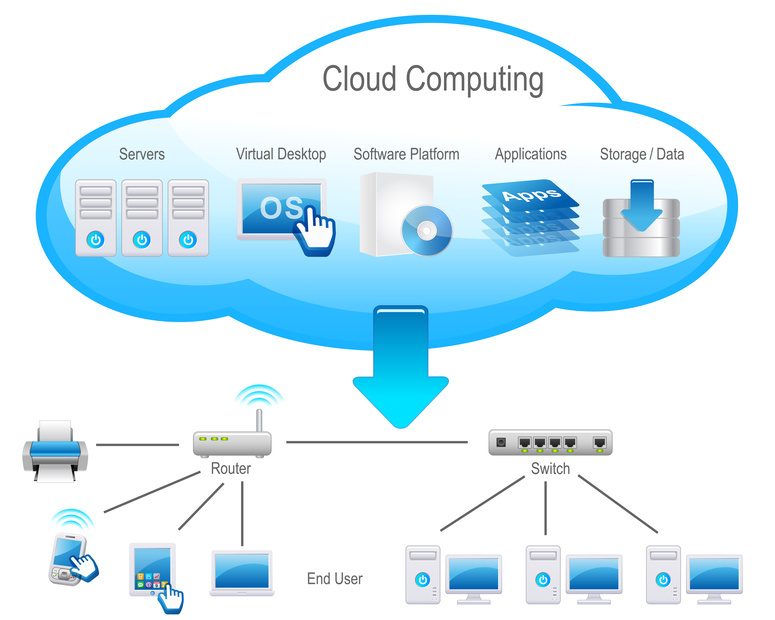 Another feature of the cloud computing services is that they are flexible. They can be used to serve a large variety of workload types – varying from small loads of a small consumer application to very heavy loads of a commercial application. Do share your feedback and additional information on cloud computing.